Here are a few suggestions for other activities for visitors to enjoy while visiting our island. We hope you will try some and perhaps come up with one or two suggestions of your own. 1. TEST your fish IQ. How many can you identify? Pick up a check off list at your favorite dive center. 2. 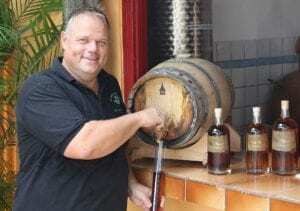 Drink a cactus, when you visit the Cadushy Distillery in historic Rincon. There you can try a variety of home-blended creations, including a smoothly spiced rum, vodka made with cadushy cactus, and whiskey made from the local maishi chiki. The distillery is open Monday, Wednesday, and Friday from 10:00 AM until 5:00 PM. 3. WINDSURF at Lac Bay, situated on the windward side of the island. All equipment is available for rent. Lessons for beginners and advanced windsurfers also can be arranged. To shop for the perfect surf-wear, see our tips for shopping. 4. FISHING is available from several boat charters to catch such fish as marlin, sailfish, wahoo, dorado or tuna. 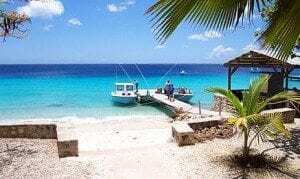 Most of this fishing is done within minutes from the shore of Bonaire. 5. SNORKEL anywhere you can fall in the water on the west coast and designated areas in the Washington/Slagbaai National Park. Guided snorkeling trips also available through most dive shops or sail charters. 6. STROLL through Kralendijk, the island’s quaint capital. Shop for bargains and one of a kind souvenirs. 7. HIKE in Washington/Slagbaai National Park to check out the birds, lizards, goats, iguanas and more. Don’t miss the museum at the Park entrance. 8. SUNSET Sailing is most enjoyable in the Bay of Kralendijk. All hotels or dive shops have information on sailing times of the various charters who search for the Green Flash at sunset. 9. HORSEBACK RIDE Bonaire has two riding stables. Visit the Horse Ranch Bonaire (tel. 786-2094) and at the end of your ride, enjoy a swim at Lac Bay with the horses. Advance reservations are necessary. Your other option is Rancho-Washikemba which offers lessons, tours, boarding, and parties. Their telephone is 788-8668. 10. FLAMINGO WATCH at the salt company or near Willemstoren lighthouse in the southern part of the island and also at Goto Meer. Bring binoculars as the Flamingo Sanctuary is not accessible to tourists and these pink, long legged creatures are very timid. 11. ENJOY a cold drink while sitting at one of our seaside bars, restaurants or cafes and watch the colorful fish swim by. Some establishments often feature local bands at the weekends. 12. VISIT Lourdes Grotto for a quiet moment. This shrine is situated in the village of Rincon. 13. CLIMB Brandaris in Washington/Slagbaai National Park. This hill is 784 feet or 241 meters high. The route is clearly marked both up and down. 14. FIND the best homemade ice cream in the Caribbean at Gio’s Gelateria on Kaya Grandi in Kralendijk. 15. TRY your luck and score a jackpot gambling at the only barefoot casino in the Caribbean located at the Divi Flamingo Beach Hotel. This casual atmosphere draws both the serious and not so serious gamblers. 16. MOUNTAIN BIKE around Bonaire with or without a guide. Your hotel can arrange rentals and guided tours. 17. RENT a scooter or moped and explore the island going north and/or south to see flamingos, lighthouses, obelisks, land houses (landhuizen), slave huts, the tourist road, Devil’s Mouth, O’l Blue, and much more. 18. RELAX on Pink Beach. Early in the morning or at sunset sit on the beach and watch the Flamingos fly to/from their nesting areas. 19. ENJOY the breathtaking panoramic views from Seru Largu overlooking the southern part of the island. This is a scenic spot for photographers from where, Klein Bonaire, Kralendijk, Lac Bay, the salt company, and more can be seen. Great spot for stargazing. 20. DRIVE through the 13,500 acre or 5,463 hectors of Washington/Slagbaai National Park. Take the “green” short route or the more scenic “yellow” longer route. Bring along refreshments or buy some at the entrance for a seaside picnic lunch. 21. DANCE the night away at Karel’s Beach Bar, located in the center of Kralendijk or enjoy a free dance workshop on Thursday evenings at 7:00 PM (locations vary), where you can learn Salsa, Bachata, Zouk, and other regional dances. 22. JOIN the parades at Carnival time in February or March. Dress up in crazy costumes; enjoy the fun in Rincon, then return to Kralendijk to continue the festivities. 23. FIND a comfortable seat on a dune by the salt flats and watch the salt being loaded by conveyer belt onto a freighter. The salt is loaded at a rate of 2,000 tons per hour. Fallen salt crystals can be found and kept as a souvenir. 24. EXPERIENCE Bonaire’s Sailing Regatta held in October. It is truly a spectator’s sport with the action clearly visible from shore. The week long festivities include nightly entertainment, and the event is held at Coco Beach. 25. CHECK out the Indian inscriptions at Onima. They are over 500 years old. Bring along some old bread to feed some of Bonaire’s 16 different species of lizards, the blue tail is particularly beautiful. 26. MARVEL at the oasis of lush vegetation at Dos Pos. The name means two wells and is located on the road from Goto Lake to Rincon. Note the fruit plantation and how many fruit trees can be identified. 27. SEE Bonaire’s outdoor market situated by the old pier in Kralendijk. This quaint Roman style building is where fruits and vegetables are sold by Venezuelans brought from their boats. Notice the historic government building around Wilhelmina Park, the Customs House and the Old Fort close to this market, and visit the local craft market when cruise ships are in port in Wilhelmina Park. 28. BIRD WATCH and head for Pos Mangel in Washington/Slagbaai National Park. 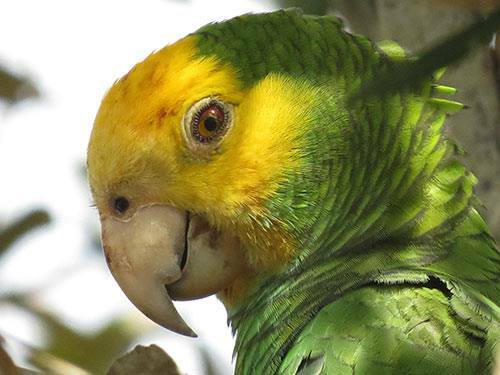 How many of the island’s 190 species of birds can be identified? 29. FIND out about Bonaire’s varied nature and culture by talking to George “Cultura” (culture) Thode, the resident expert. George can usually be found at the entrance of Washington/Slagbaai National Park where he oversees the Park Rangers and makes sure all visitors are aware of the Park’s rules and regulations. Ask him about the flora and fauna, especially the innumerable aloe and cacti. 30. TAKE A TOUR of one of Bonaire’s caves, with a knowledgeable, registered guide. Check with your hotel’s reception to book a tour with a government-approved cave guide. 31. VISIT THE DONKEY SANCTUARY where you can enjoy the beauty of this ecological park and observe the donkeys in their natural environment. 32. GAIN some knowledge of Papiamentu, the native language of the Dutch Caribbean. Try saying a few words in one of the local shops or restaurants and listen to how many languages are spoken on Bonaire. 33. SHOP in Kralendijk for souvenirs to take home and don’t forget to visit Warehouse or Van den Tweel Supermarket, the largest grocery stores on the island. Pick up a wheel of delicious Dutch Gouda cheese. Get InfoBonaire’s tips on how to shop for the perfect beach- and surf-wear. Learn more about seeking out Bonaire’s unique gift and souvenir ideas. When cruise ships are in port, don’t miss the island’s unique Art & Crafts Market. 34. Take a walk on the wild side! Visit a restored Kunuku (farm), Rooi Lamoenchi and take a walking tour of the flora and fauna of Bonaire. Ellen Herera will lead you through an historic and informative journey into our island’s past. Or WALK the island’s eastern shores for a refreshing saltwater shower. The rough surf pounds the shore shooting spray twenty to thirty feet in the air. Notice the artwork by Bonaire’s mysterious natural artists. Drive, walk, or cycle the Bara di Karta Route on the windward side of the island. 36. LOOKING for a “Kodak moment?” Drive to Gotomeer, Bonaire’s land-locked saltwater lake, where this beautiful viewing spot looks over the lake towards the National Park. This is also a good place to take pictures of the flamingos as they often feed or sleep close to the road. 37. CRUISE around Klein Bonaire and the coast of Bonaire with one of the sailing charters. 38. ADMIRE the rock formations around the island. Find out what the rock formations resemble. Where is the Iguana Head or Devils Mouth? Find the Indian Head or the Piedra di Boneiru. At Boca Onima see the five “steps” of Bonaire and observe the wild donkey population. 39. ART GALLERIES are found in many locations. The galleries feature work of local and Caribbean artists. Visit Jan Art at her gallery on Kaya Gloria or see Jenny Rijna’s life size dolls at her home on Kaya Gilberto F. Croes. An unusual open-air market featuring the work of many of Bonaire’s artisans can be found in Arts & Crafts Market, held in Wilhelmina Park. 40. TENNIS anyone? There are tennis courts at Harbour Village and Sand Dollar and in the center of Kralendijk behind the Maduro & Curiels Bank. 41. CHECK out the shell collection at “Museo Boneriano”, Bonaire’s Museum. Other items to see here are antique artifacts, old photographs, archeology, island mythology and much more. 42. COUNT the steps at 1000 Steps located on the tourist road going north. Are there 1000 steps? This is an excellent place for snorkeling, exploring and picnicking. Imagine carrying dive gear plus a tank back up these steps! 43. PULL off the road at Para Mira, which coincidentally means “stop and look” and enjoy the view over Rincon, Bonaire’s Spanish missionary village. 44. LEISURELY walk around Rincon, the oldest village on Bonaire, with the highest goat population! The people are very friendly and some of the homes are very old. Stop at Rose Inn for a refreshing cold drink and see many birds feeding in the garden. Visit the Bonaire Heritage Foundation to pick up a pamphlet for a self-guided walking tour, or sign up for the tour with a resident guide from Rincon. 45. MOTOR or cycle to Lagoen for interesting beach combing. The ambitious can walk or drive to Spelonk Lighthouse, which is a delightful old building. 46. SEAKAYAK through the mangroves. 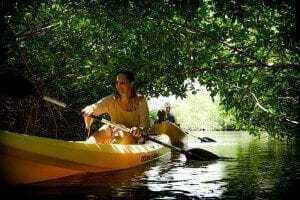 Kayaks can be rented from the Mangrove Info Center, windsurfing places at Lac Bay, and at a number of dive centers. Or snorkel in the mangroves for a truly unique experience. 47. FIND Playa Frans by going past the oil storage terminal at Goto Lake. On the return journey stop at popular Nukove beach for a picnic, snorkel, or swim. 48. STAR GAZE Wait until dark and turn your eyes towards the heavens for one of nature’s most popular shows. 49. PICNIC on the deserted island of Klein Bonaire (“Little Bonaire”). Depending upon the water taxi ride, Klein Bonaire is located approximately 0.5 mile or 750m off Bonaire’s western coast. Try Kantika di Amor (phone: 796-5399, which is also handicap accessible) or Good Return (phone 788-7503). 50. Get adventurous and Kiteboard! Kiters can KITE SURF off the shores of Atlantis, where rental equipment, lessons, and rescue equipment are available. Atlantis offers steady tradewinds and calm and crystal clear water. Kitesurfing is prohibited in Lac Bay. 51. TAKE a Walking Tour of Downtown (pick up a map at the Tourism Information Office) and see some of Bonaire’s history. 52. When in RINCON, visit Mangazina de Rei Botanical Garden or take a walking tour with Soldachi Tours. Or, if you prefer to do it on your own, pick up the booklet, Historical Walking Tour, available at the Cadushy Distillery in Rincon or Addo’s Toys & Books in Kralendijk. 53. Try GOLFING on Bonaire. Both club members and tourists can tee up on Bonaire’s only course, Piedra So, with 18 holes. In Papiamentu, Piedra So literally means “only rocks”, so this course will be a little different from what you may be used to! Imagine playing in a completely natural environment, which means no grass-grown fairways or sophisticated greens, but instead fairways with sparse local vegetation and “browns”, existing from local soil, instead of greens. These browns are maintained as often as possible, so putting is not so difficult. 54. Go BONEFISHING (catch and release only). Captain Chris Morkos from Piscatur Fishing Charters is an excellent guide to take you to the best locations!